Restarted earlier this month after a 15-month suspension, the sand-refill project at the far northern end of Pattaya Beach was halted this week when the Marine Department decreed that the sand brought in from Koh Rang, a small island south of Koh Chang, doesn’t match Pattaya’s beachfront well enough. Marine Director Eakaraj Kantaro said no more of the Trat Province sand will be brought to Pattaya and the entire project will be sent back, once again, to consultants at Chulalongkorn University who twice before recommended the wrong sand. This process of sending it back is expected to set the project back at least a year or more at this time. Previous contractor Kijakarn Ruamka Marine Construction Co. restarted work on the 483-million-baht project – which has ballooned far over that first estimate due to the many stops, starts and new-contractor contracts – in October 2016 following a 13-month hiatus. The original plan to re-sand and clean up the beach has now been going for nearly a decade since the first attempts to do so in 2011. 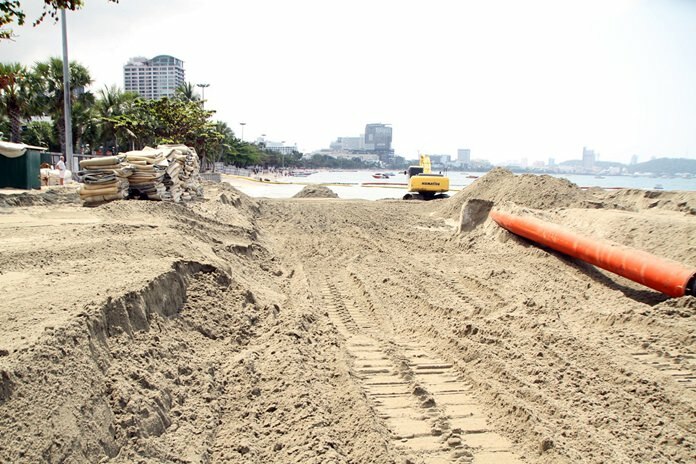 Pattaya originally planned to bring sand from a Rayong estuary to an offshore barge in Pattaya, then use smaller equipment to bring the sand to shore and refill the beach and install supporting frames and breakwaters starting from the Dusit Curve southward. Objections from Rayong provincial officials resulted in Pattaya not being able to obtain enough sand from that source, so it chose a section off of Koh Khram as a new source. However, that sand was found to not match Pattaya’s own sand well enough and a new source was needed. The Royal Thai Navy also has objected to removing sand from the island it controls, the region’s main breeding ground for endangered Green and Hawksbill sea turtles. Plans to rebuild Pattaya Beach began in 2011 when researchers from Chulalongkorn warned that the beach would disappear within five years if nothing was done to counter erosion. Yet despite the urgent warnings, funding for the project was repeatedly delayed. Pattaya has sporadically performed stop-gap refill projects that only extended the beach’s life expectancy a few years. In 2014, the lead consultant in Chulalongkorn’s Geology Department said that in 1952 Pattaya Beach covered 96,128 sq. meters and was, on average, 35.6 meters wide. By 2011, the beach had shrunk to as little as 3.5 meters. Today it is at most five meters wide. But even seven years ago, researchers warned that a massive beach-refill project would not permanently solve the problem. Erosion has carried away about 10,000 cu. meters of sand a year. If that continues, more would be added in the next decade, he said. 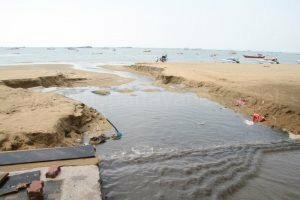 We here at the Pattaya News will provide updates, but as the authorities continue to squabble over the project the beach continues to erode more and more. 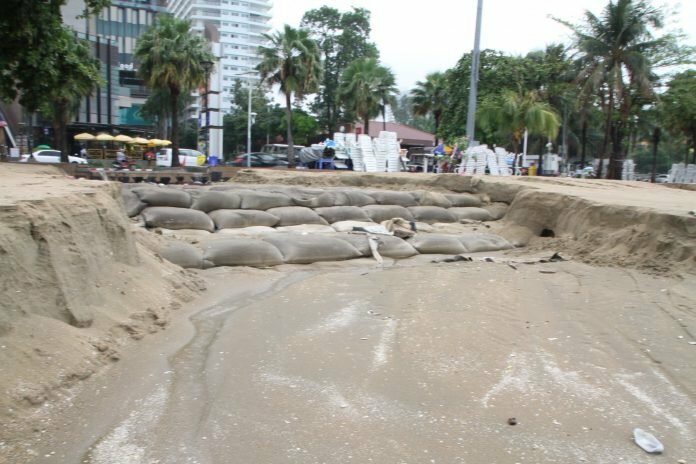 The Pattaya Harbor Department has admitted that their best laid plans to improve the beach have gone completely pear shaped. Following a storm a huge swathe of the 400 million baht new sand project has just been washed away. It was only recently finished as was trumpeted as a lovely beach. Ekkarat Khantharo said it was a crisis and he was extremely worried about the situation. The Pattaya News said that up to 200 meters of the beach in a dozen locations had been swept out to sea. He told the media that mother nature was to blame and the Harbor Department always accepted that something like this could happen. Now they plan to spend another 105 million baht over the next year. Earlier in the week a TNAMCOT video praised the massive project to solve sand erosion on a 2.8 kilometer stretch from North to South Pattaya. It was finally completed just last month. The only problem on the beautiful sands was a lack of tourists. Now the sand has been washed away in the storms and Pattaya's landmark project is in tatters. How about replacing the sand with concrete? This might be a stupid question, but why not dredge the eroded sand back onto the beach? A suction dredge would do this in a matter of days. because it's probably spread far and wide, a 1mm layer over hundreds of hectares of ocean floor.